Description: In the Middle Ages the city was a royal residence and was one of the most important cities of Hungary. In the Székesfehérvár Basilica, 37 kings and 39 queens consort were crowned, 15 rulers have been buried here, the diets were held and the crown jewels were kept here. (from Wikipedia). The St. Imre church was built between 1740-1743 by the Marianus Franciscan Order. The church was designed by Franz Kotz and Paul Hatzinger. The 52 meter high tower was built in 1886. The tower has two bells. 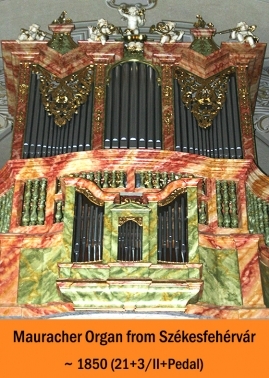 The organ was built by the Mauracher company in the 1850s. The Rieger-brothers expanded the organ in the 1920s. Unfortunately, the documentation of the organ is lost, so we can no more about it. Korb Gabor made a new electrical tracker and console in 2003. He has improved and tuned the organ and restored the beautiful Baroque organ-case. This organ is a very nice preserved original small romantic instrument, which praises the work of masters of southern Austria. The voice of the small organ is charmingly beautiful and translucent in the big church space.